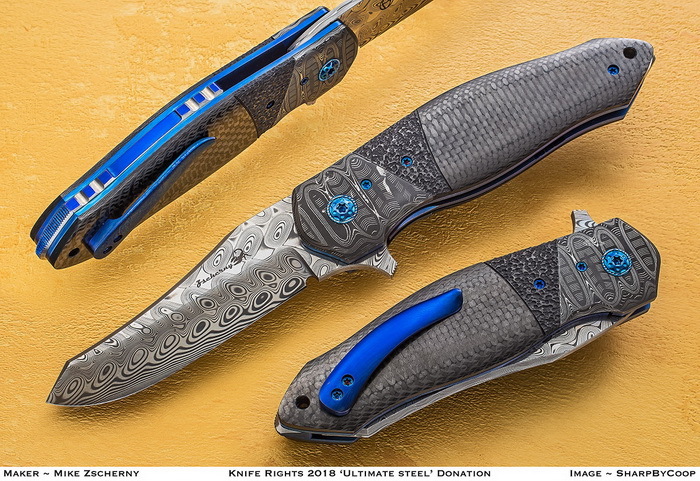 **** Chosen by Winner: Sean M.
Mike Zscherny has crafted a dazzling version of his Destiny flipper folder with a 3.5-inch Damasteel modified skinner blade. The handle is stippled and smooth Carbon Fiber with Damasteel bolsters. The Titanium 3D-machined pocket clip, Titanium liners, screws, pivot and backspacers are bright blue anodized.